Welcome to the first day of spring! Spring means baseball and baseball means more game-winning moments like this. The coming of spring also means the end of winter and, for some, the end of careers. Fellow collector Steve F. noted (on this Phillies Room post) that he'd recently found the last pro card of thrice-retired James Paul David Bunning, who first called it quits as a moundsman after going 5-12 for Philly in 1971. Jim went right from pitching in 1971 to managing at Reading (PA) in 1972, a leap that foreshadowed his later political progress from city councilor to US Representative and two-term Senator. After that one year in Reading, Bunning spent 1973 helming Eugene (OR), but might not've liked that part of the country and moved back east to manage Toledo's famous Mud Hens for 1974-75. 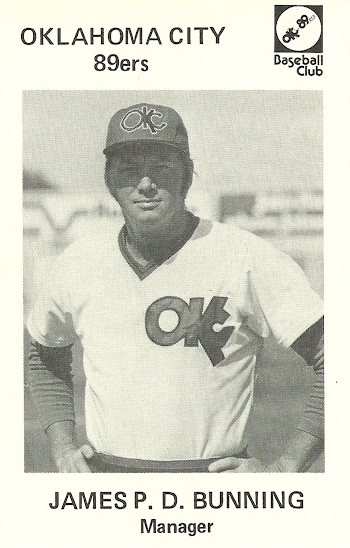 Oklahoma City's 1976 team set shows Bunning at the wane of that second career and now sporting the glasses he'd continue to wear as a politician. It's tempting to wonder if Jim would've continued in baseball given the MLB reins in Philadelphia, but Danny Ozark was too successful (back-to-back 101 win seasons 1976-77) to push for that job. I suspect that convinced Bunning to try his luck with Kentucky voters. Bunning apparently signs through the mail (TTM) and this would be a rare card autograph to land. Good luck to Steve and any others who give it a go! TRIVIA: Only Cy Young, Jim Bunning, Gaylord Perry, Nolan Ryan, and Dennis Martinez have won 100 games in both leagues. BONUS TRIVIA: Bunning's the only MLB pitcher to walk exactly 1000 batters (career stats).